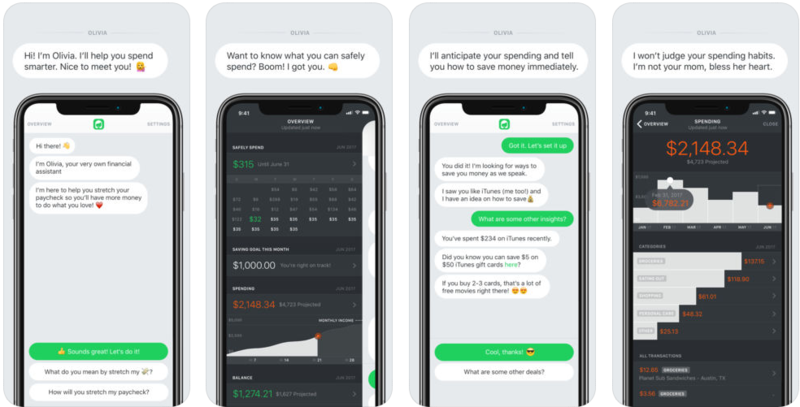 Olivia.AI is a personal financial assistant app for iOS powered by behavioral economics and artificial intelligence to help advise users to make smarter decisions with their money. Let's go over the design process behind Olivia in the context of grocery shopping. To illustrate the mindset of this issue, we have a story of a Millennial named Bill Billings who has trouble saving money on groceries. 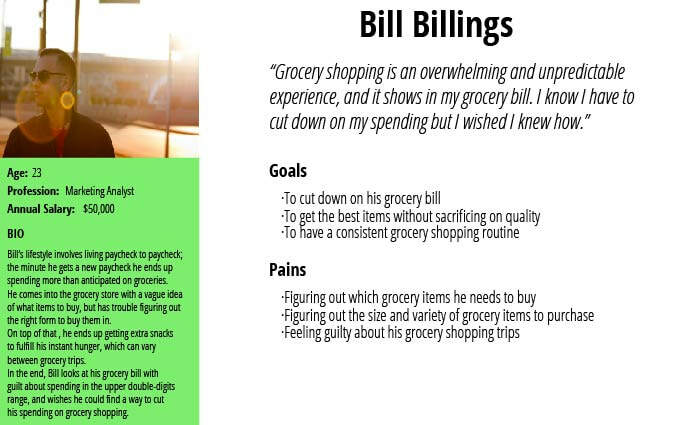 How can we help Bill make the best financial choices that will lower his grocery bill? The first step in solving Bill's problem was to understand the steps he takes when goes grocery shopping. 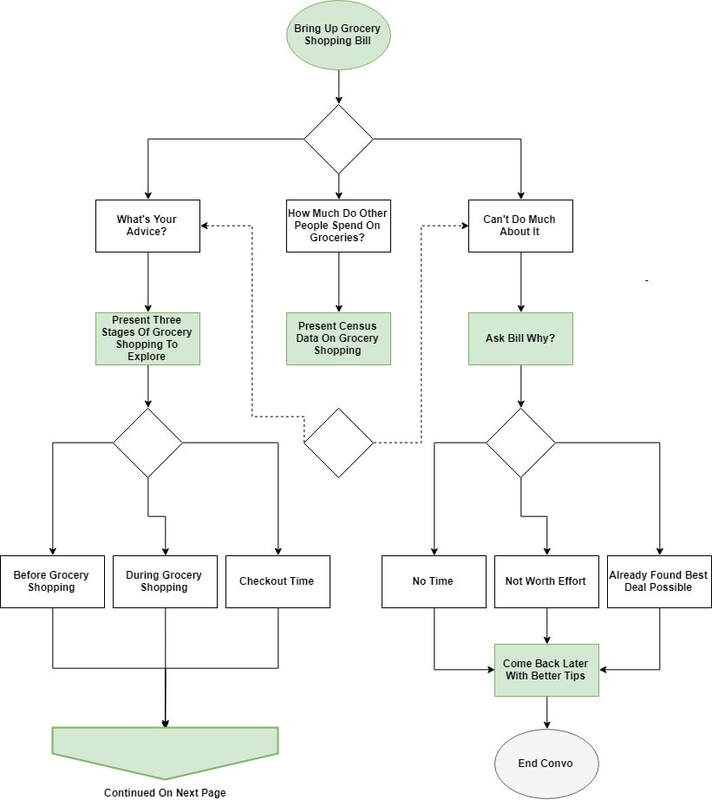 I created a customer journey map to illustrate his actions and thoughts involved with going grocery shopping. Goes Grocery Shopping At Random Days - Bill doesn't have a consistent day or time for going grocery shopping. 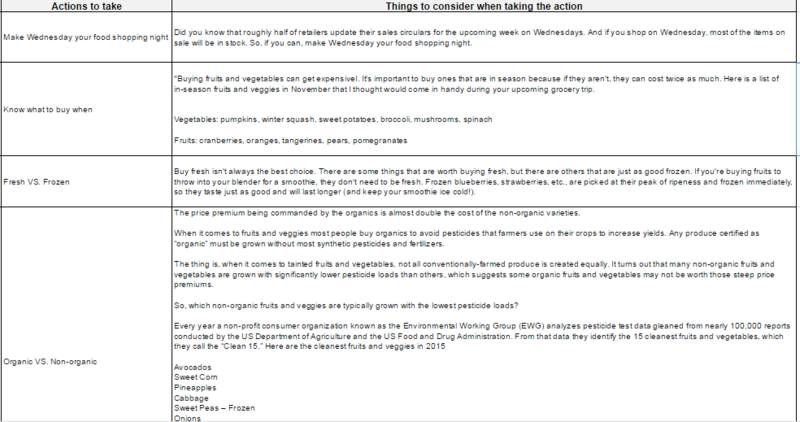 Goes Into The Grocery Store With No Plan - Bill tends to not write down the items he needs to purchase in a list. Gets Tempted Really Easily - He tends to go to the grocery store when he's hungry and as a result gets tempted by snacks. Trouble Deciding Between Items - He has trouble deciding between two similar items, such as organic vs. regular. ​With all these behavioral gaps in mind, we decided to address his issues in the form of a conversational user interface that would allow him the ability to receive advice on how to save money during the whole grocery shopping journey. The first step in designing the conversations was to do some secondary research on all the grocery shopping tips ranging from the basic to special pro tips. 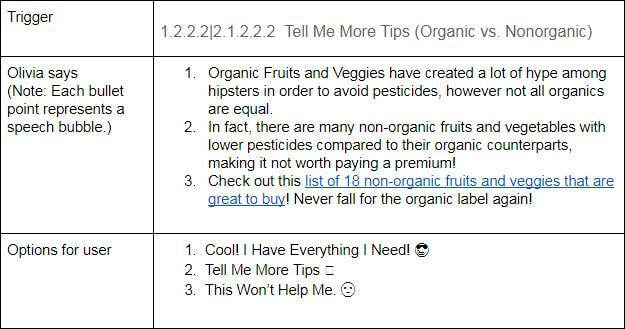 After I found a general consensus of all the tips online from various credible articles, I aggregated them into a spreadsheet and divided them into the type of tip it is followed by the considerations to be made for more specifics. As soon as all the tips were aggregated into the spreadsheet, I started creating a conversation map to illustrate the flow of how Olivia would interact with Bill. The conversation map served as an outline for how Olivia would introduce each tip ranging from high-level tips early in the map to pro tips later in the map. Conversational User Interfaces have been getting a lot of buzz lately in the world of technology, with the potential of supplanting the GUI for certain applications whether it be eCommerce, booking a flight, or receiving advice. The design of the app wouldn't have been possible without understanding the cognitive biases people have with money as well as applying persuasive psychology to improve spending behavior. Ariely, Dan. Predictably Irrational. New York: Harper Perenial, 2010. Paperback. • On Amir, Dan Ariely and Ziv Carmon (2008), “The Dissociation Between Monetary Assessment and Predicted Utility.” Marketing Science. Vol. 27, No. 6: 1055- 1064. H.K. Baker, V. Ricciardi(2015), "Understanding Behavioral Aspects Of Financial Planning and Investing." Journal Of Financial Planning. Vol. 28, Issue 3, pp. 22-26. Cialdini, Robert. Influence, The Psychology Of Persuasion. New York: Harper Business, 2006. Paperback. Eyal, Nir. Hooked, How To Build Habit Forming Products. New York: Portfolio, 2014. Hardcover. Kahneman, Daniel. Thinking Fast and Slow. New York: Farrar, Straus, and Giroux, 2011. Hardcover. Leonard Lee and Dan Ariely (2006), “Shopping Goals, Goal Concreteness, and Conditional Promotions.” Journal of Consumer Research Vol. 33: 60-70. G. Lowenstein and J.S. Lerner(2003), "Role Of Affect In Decision Making." Handbook Of Affective Sciences, Vol. 31: 619-641. K.L. Milkman, T. Rogers, and M.H. Bazerman(2008), "Harnessing Our Inner Angels And Demons: What We Have Learned From Want/Should Conflicts And How That Knowledge Can Help Us Reduce Short-Sighted Decision Making." Perspectives on Psychological Science, Vol. 3, No. 4, 324-338. K.L. Milkman and J. Beshears (2009), "Mental Accounting and Small Windfalls: Evidence From An Online Grocer." Journal of Economic Behavior and Organization, Vol. 71, No. 2, 384-394. Stanton et. al. (2014), "Effects Of Induced Moods On Economic Choices." Judgement And Decision Making, Vol. 9, No. 2: 167-175. R.H. Thaler, S. Benartzi(2004), "Save More Tomorrow: Using Behavioral Economics To Increase Employee Saving." Journal Of Political Economy, Vol. 112, No. 1, pp. S164-S187.